The face of a modern human is almost uniquely flat and extraordinarily expressive. But our remarkable faces may not be as "modern" as we think. 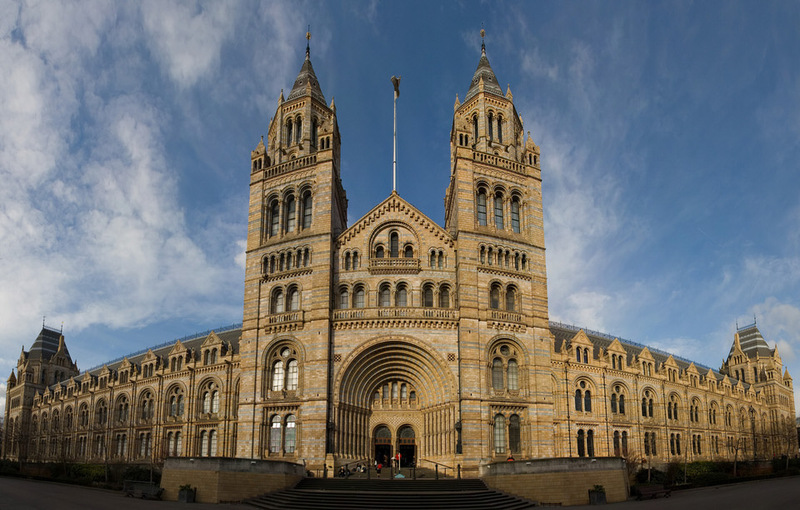 Visitors at the Natural History Museum in London can see a selection of skulls that once belonged to our prehistoric ancestors which have been cast in metal and put on display. Children run their hands over the skulls' heavy brows and protruding jaws. These reconstructed faces look impassive, but a range of emotions are painted onto the visitors' faces. "It looks like a monkey," exclaims an excitable young boy, looking at a replica of a skull. One small girl looks shy as she peeks around the legs of an adult. Joy covers the faces of three boys running wildly past, anger flickers onto the face of the teacher who scolds them, and tears flood from another child who was pushed over in their haste. The children are all living, breathing examples of how extraordinarily expressive our faces are. Human faces convey a huge range of emotion and information through subtle shifts in the muscles around our eyes and mouth. No other animal has such an expressive face. What's more, each of us can instantly recognise another member of our species with a glance at their face. No other species shares our flat face, high forehead, small jaw and jutting chin – not even the many human-like species that went before us. 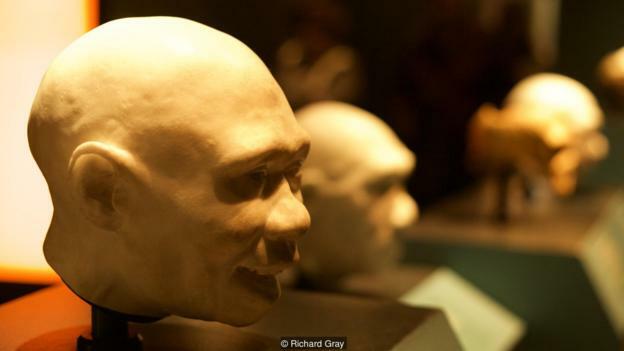 The question is, when did humans start to look like we do today? New scientific techniques and discoveries are starting to provide answers. But they are also revealing that our distinctive facial features may be far older than many anthropologists originally believed. "As the last surviving species of humans on the planet, it is tempting to assume our modern faces sit at the tip of our evolutionary branch," says Chris Stringer, an anthropologist at the Natural History Museum in London, as he joins me in the gallery. The Neanderthal face was huge, with an enormous nose "And for a long time, that has been what the fossils seemed to indicate," he continues. "Around 500,000 years ago, there was a fairly widespread form of Homo heidelbergensis that has a face somewhat intermediate between that of a modern human and Neanderthals. For a long time, I argued this was our common ancestor with Neanderthals." Stringer shows me the cast of a real H. heidelbergensis cranium that was found at Broken Hill in Zambia in the 1920s, and which is now kept safely in the museum's fossil collection. It is the same skull that the little boy stood in front of earlier. With a bit of guidance, it is easy to see why this species could be the common ancestor of modern humans and our extinct cousins the Neanderthals, who died out around 40,000 years ago. 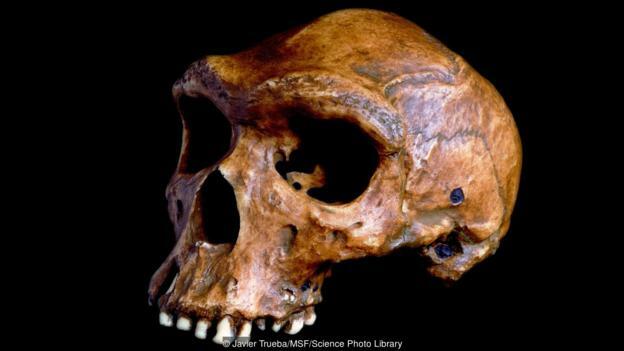 Modern humans have small noses and our jaws sit beneath the rest of our skull. Our cheek bones are angled and each cheek has a distinctive hollow beneath the eye socket, known as the canine fossa. In a sinkhole in the mountains, fragments of a small, flat-faced skull were unearthed. By comparison the Neanderthal face was huge, with an enormous nose and the front of the face pulled forward. Around the cheeks the skull curved outwards, rather than being hollowed out. To our eyes, this would have given them a puffy appearance. They also had a far flatter forehead than we do, while above their eyes was a pronounced double arch of the brow-ridge that hung over the rest of their face. H. heidelbergensis had a slightly flatter face than the Neanderthal and a smaller nose, but no canine fossa. They also had an even more pronounced brow-ridge than that seen in Neanderthals. For decades, most anthropologists agreed that Neanderthals had retained many of these features from H. heidelbergensis as they evolved and developed a more protruding jaw, while our own species went in a different direction. 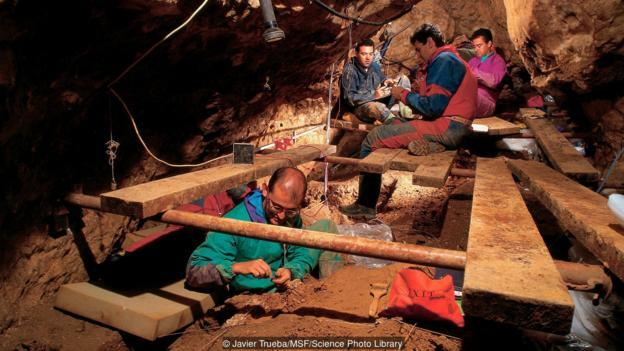 That was until the 1990s, when a puzzling discovery was unearthed in the Sierra de Atapuerca region of northern Spain. In a sinkhole in the mountains, fragments of a small, flat-faced skull were unearthed, alongside several other bones. 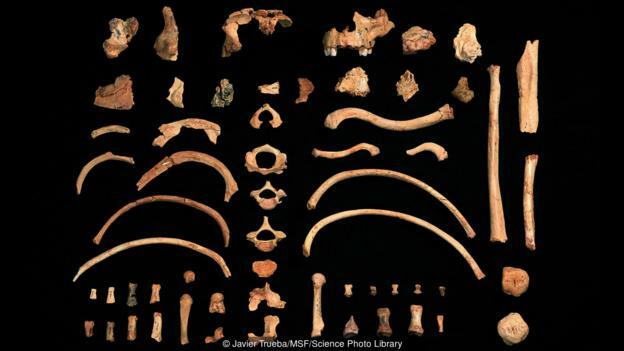 The remains were identified as belonging to a previously unknown species of hominin. It was called Homo antecessor. It was assumed that it would fill out and grow into something resembling heidelbergensis. The face of this new species of human ancestor appeared to be far more like our own, and even had the distinctive hollowing of the canine fossa. Yet it lived 850,000 years ago, well before H. heidelbergensis. At first, this apparent contradiction was hand-waved away. The Atapuerca skull belonged to a child, aged around 10 to 12 years old. It is difficult to predict what this youngster's face would have looked like in adulthood, because as humans age their skulls grow and change shape. "It was assumed that it would fill out and grow into something resembling heidelbergensis," says Stringer. However, later discoveries suggest this is not the case. "We now have four fragments from antecessor adult and sub-adult skulls," says Stringer. "It looks like they maintain the morphology we see in the child's skull." It is still difficult to make direct comparisons between hominin skulls. For one thing, many are incomplete. But even setting that aside, a phenomenon known as allometry means that changes in size also lead to changes in shape, because different body parts grow at different rates. It seems the Neanderthals are more evolved in their own direction than modern humans. To get around this problem, Jean-Jacques Hublin of the Max Planck Institute for Evolutionary Anthropology in Leipzig, Germany, and his colleagues have created computer models that let them "grow" skulls virtually. 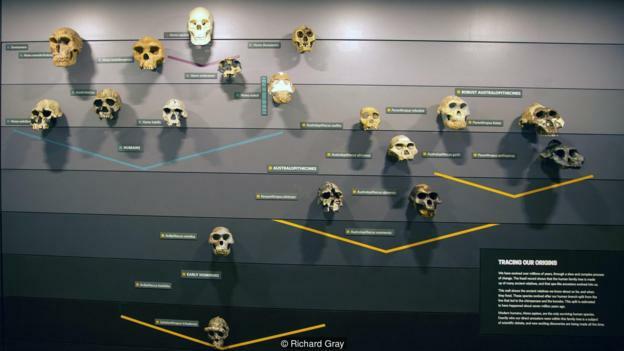 "When we do this, we can explain the variation in shape between Neanderthals," says Hublin. "But if we grow a modern human skull to the size of a Neanderthal, we don't have something that looks like a Neanderthal. You get something different." Hublin thinks that modern humans have retained a lot of primitive features from our distant ancestors. 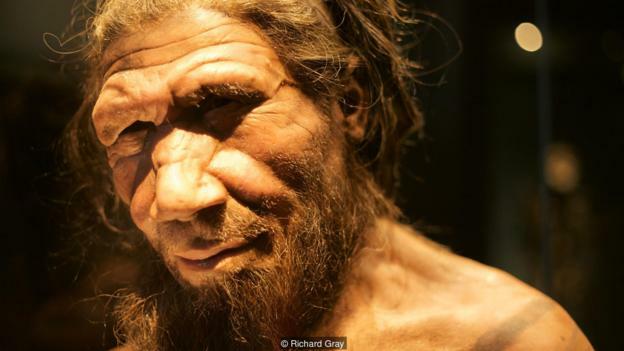 "It seems the Neanderthals are more evolved in their own direction than modern humans," he says. "They would have looked very peculiar to our eyes." 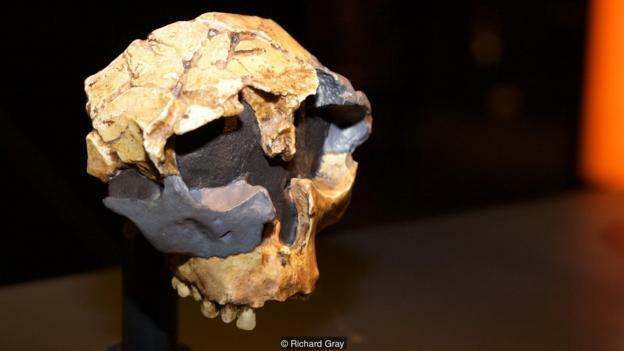 In other words, the faces of modern humans may not be all that modern at all. "The term 'modern' is somewhat misleading," says Hublin. "When you say 'modern', people assume you mean 'more evolved', but in fact in our case it may mean 'more primitive'." Our bones are continually renewed and remodelled. Hublin and his team can also use their software to mature the skulls of children, giving an idea of what they would have looked like when they became adults. When they applied it to the skull fragments of H. antecessor, they got something that looked both primitive and modern at the same time. "The face has more prominence than modern humans," says Hublin. "But it doesn't have the derived features we see in the Neanderthal." Something even more surprising emerged when the fossilised skulls of H. antecessor were placed under a microscope. Throughout life, our bones are continually renewed and remodelled. This leaves distinct patterns on the bone, which can reveal how it grew and formed. In particular, cells that deposit bone, known as osteoblasts, create a smooth surface – whereas those that absorb bone, called osteoclasts, leave it pitted with microscopic craters. In modern humans, the area beneath the nose and around the upper jaw – known as the maxilla – is rich in cells that absorb bone. But in Neanderthals, H. heidelbergensisand other early hominins like Australopithecus, this area had lots of cells that deposit bone, causing the face to protrude forwards. We last shared a common ancestor with Neanderthals around 700,000 years ago. "Modern humans show widespread areas of resorption all over the maxilla," says Rodrigo Lacruz of the New York University College of Dentistry, who has led much of this work with his colleague Timothy Bromage. "It is this resorption that helps maintain the human face where it is under the cranium, rather than protruding far forward." Similar patterns of bone resorption can be seen around the canine fossa in modern humans, whereas Neanderthal skulls show widespread bone deposition. So when Lacruz, Bromage and their colleagues popped the skull fragments from H. antecessor under the microscope, they were staggered to find that the maxilla and canine fossa were heavily pitted. Not only that, but the pattern of bone reabsorption they noticed was similar to that seen in modern humans. "These similarities suggest that one of the key developmental changes responsible for the characteristic face of modern humans can be traced back to H. antecessor," says Lacruz. "This is important, because antecessor not only showed this human-like growth pattern, but also shows some human-like morphology around 800,000 years ago." That date is significant, because the most recent studies of the human family tree suggest that we last shared a common ancestor with Neanderthals around 700,000 years ago – not long after H. antecessor's time. Faced with all these findings, Stringer and many of his colleagues are now reassessing their ideas about the evolution of the human face. Speaking at a conference in Madrid in September 2016, Stringer and several other leading experts argued that H. antecessor, or a close relative yet to be discovered, may be a better fit as the common ancestor of our species and Neanderthals than H. heidelbergensis. H. antecessor is thought to have appeared at around the time of the first exodus of hominins from Africa, between 1.8 and 0.8 million years ago. This would mean that our face is actually quite primitive compared to H. heidelbergensis and Neanderthals. Some of the oldest footprints to be found in Europe – discovered at Happisburgh in the UK in 2013 – are thought to have been left by H. antecessor. Some Spanish remains also initially attributed to H. antecessor – a molar and part of a mandible – have been dated to 1.2 million years ago, although the team that discovered them has since become more cautious about their identity. Under the new evolutionary tree that is being proposed, our species evolved from H. antecessor. Meanwhile, H, heidelbergensis diverged around 500,000 years ago and evolved independently, leading to Neanderthals. "This would mean that our face is actually quite primitive compared to H. heidelbergensis and Neanderthals," says Stringer. If that is true, it would help to explain many of the differences we see between us and our evolutionary cousins. 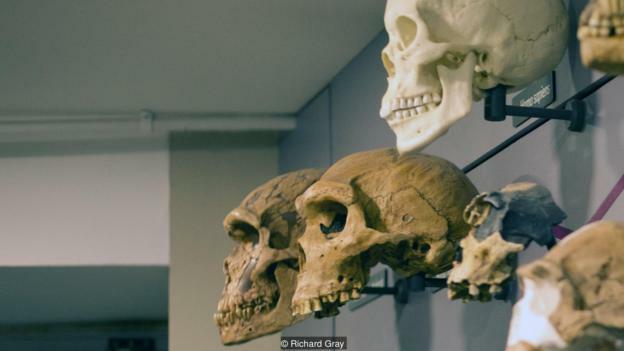 While modern humans and Neanderthals both evolved big brains, made tools, hunted, used fire, created jewellery and developed culture, our bodies evolved in different ways. Even our brains were different shapes. Something in those archaic hominins required them to have a large nose. Paul O'Higgins of the University of York, with Ricardo Godinho and Penny Spikins, has tried to unravel why these differences appeared. Using engineering principles, they have analysed the fossilised remains of prehistoric hominins, and modern humans, using 3D computer models. 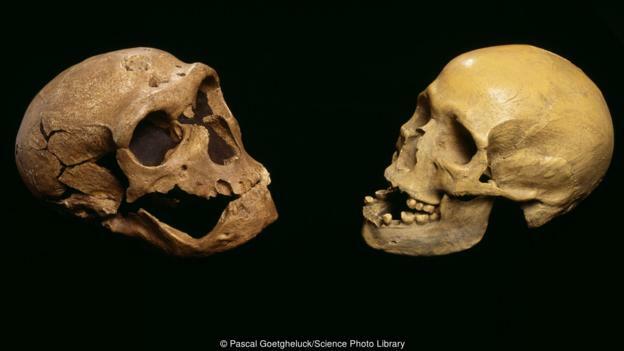 The team was surprised to find that, despite their big jaws, H. heidelbergensis were much less efficient at biting than modern humans with our smaller, flatter faces. The shape of the H. heidelbergensis skull and the position of its muscles means they cannot physically generate intense bite forces, even though their bones are capable of withstanding them. Similar work has shown the same pattern in Neanderthals. "The bone in modern humans fractures much earlier," says O'Higgins. "It suggests efficient biting we get from our flat faces was not the result of natural selection, but something else." It now seems that our powerful bites are related to the size of our noses. "Something in those archaic hominins required them to have a large nose, which requires a large face," says O'Higgins. "Whether that was energetic demands or climate we are not entirely sure. But when you lose the need for a large nose, we found the face begins to tuck under the brain, and bite force increases incidentally." The popular explanation for Neanderthals' big noses is that they were an adaptation for the cold climates of the Pleistocene ice ages. The large nasal cavity would have warmed the cold air before it reached their lungs. However, in a 2010 paper Stringer showed that Neanderthal sinuses did not lie outside the size range found in modern European humans. Instead, it appears the large noses seen in H. heidelbergensis and later Neanderthals may have appeared "by accident" through genetic drift, after they split from their common ancestor with modern humans. Another prominent difference between modern humans and our ancestors may have vanished from our lineage for a different reason. 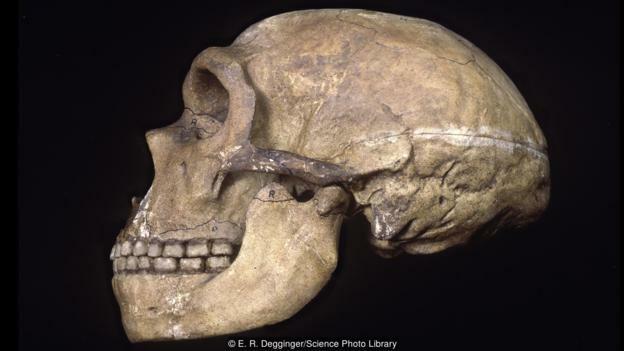 "H. heidelbergensis and Neanderthals had gigantic brow ridges," says O'Higgins. "It was like having a peaked cap on the top of the forehead." With big brow ridges, the movement of the eyebrows is limited. In research presented at the Madrid conference, he and his colleagues used their computer models to shave away the brow ridges, then looked at how this affected the structure of the face and skull. They found that the brow ridges did not provide any structural advantage. Instead, they believe these prominent arches of bone above the eyes may have served to signal dominance to other members of the species, much like the huge antlers of modern male moose. 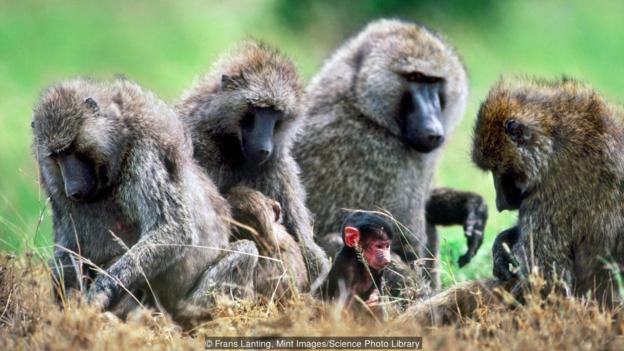 Stringer has also suggested this, comparing ancestral hominins to olive baboons. These monkeys raise their eyebrows as part of their dominance displays. Similarly, mandrills also use bright colours on their eyebrows and snouts to indicate their rank in their group. At the 2016 meeting, O'Higgins and his colleagues presented preliminary findings suggesting that, when our ancestors lost these aggressive-looking brow ridges, they gained a subtler form of communication. "With big brow ridges, the movement of the eyebrows is limited," says O'Higgins. But that changes when the ridges disappear. "When you have a flat face, you have a vertical forehead and suddenly you can move your eyebrows up and down. This means you introduce much more nuanced social communication. You can tell if someone is cross, happy or angry." Our faces are among our most valuable tools. If that is true, it implies that it was our status as a social, cooperative species that led us to keep our primitive faces. Our facial expressions form a key part of our social interactions, helping us instinctively work out what someone is feeling or thinking. O'Higgins's research suggests that we would not be able to do that if we had evolved faces like those of the Neanderthals. Ultimately, research like this could tell us which of our hominin ancestors were able to smile, frown or show disgust with their faces as we do. It is also a reminder that our faces are among our most valuable tools. If they were different, we could not communicate with each other as effortlessly as we do.